This well-researched disclosure is important! It shatters the underlying myth and scapegoating upon which efforts by Congress, some State Legislatures, some "conservation" groups, and industry are trying to increase logging on federal public lands, even if it means turning control or title of those lands over to the States! Conservation groups enforcing America's bedrock environmental protection laws in court is not the problem industry allies say it is! Senator Tester and others are simply going to have to find a new myth and a new scapegoat in order to do the timber industry's bidding! Tester last week told Montana Public Radio "Unfortunately, every logging sale in Montana right now is under litigation. Every one of them." The Washington Post finds "there are 97 timber sales under contract in Montana's national forests. Of that number, just 14 have active litigation, so about 14 percent. But only four of the sales are enjoined by a court from any logging." When Tester was again questioned by MTPR, he suddenly became "unavailable" for the week and his staff shifted to talking timber volume, claiming "Nearly half of the awarded timber volume in Fiscal Year 2014 is currently under litigation." The Washington Post finds this to also be a lie, finding only about 10% of the timber volume under contract is halted by litigation. The Washington Post has awarded Tester "Four Pinocchios," its worst rating for telling a "whopper" - in this case two whoppers. Click "Read Full Article" below to read more about how such lies are the false premise upon which even some "conservation" groups are basing their collaboration with industry to increase logging on federal public lands. 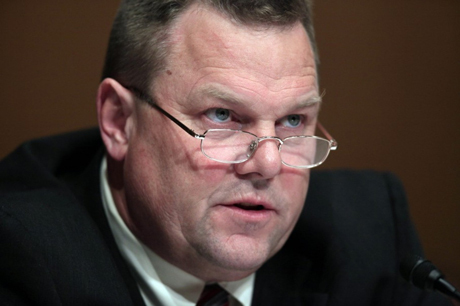 Senator Jon Tester's (D-MT) Forest Jobs and Recreation Act (the result of a collaboration between Montana Wilderness Association and the timber industry) would mandate timber harvest on up to 100,000 acres of several National Forests in Montana and streamline regulatory approval for timber contracts. 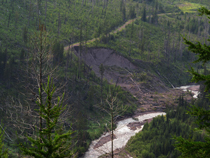 Senator Steve Daines (R-MT) wants to up the ante in his Restoring Healthy Forests for Healthy Communities Act, "a bill that increases the amount of timber harvested on all federal lands while decreasing public participation and bypassing environmental analysis for logging projects smaller than 10,000 acres." (Click here for source). The Montana Woods Products Association and F.H. Stoltze Land and Lumber Company heap praise on The Wilderness Society for collaborating with the timber industry; in a joint press release that also badmouths "those anti-collaboration 'environmentalists' who regularly use litigation as leverage to influence Forest Service policy." (Click here for source). The Wilderness Society accepted Senator Daines' invite to help reform National Forest management and heaped praise on collaboration. TWS urged him to "work with coalitions of the willing" and to ignore those who don't agree with the underlying premise that our National Forests have too many trees. (Click here for source). The Wilderness Society, the Nature Conservancy and National Parks Conservation Association were invited by Senator Daines to attend his Forest Management Reform Rountable at F.H. Stoltze Lumber near Kalispell. Daines predictably laid the blame on timber sale litigation. TWS, TNC and NPCA reportedly kept pretty quiet but admitted they have bought into Daines' underlying premise that logging and environmental protection don't currently co-exist and that National Forest management "reform" is needed. (Click here for source). Because TWS, TNC and NPCA apparently failed to criticize Daines' efforts to increase federal logging and limit citizen lawsuits to enforce environmental laws, the Kalispell Daily InterLake was left to call Swan View Coalition to secure a single statement critical of Daines' agenda. (Click here for source). Under requirements of the 2014 Farm Bill, Montana's Governor Steve Bullock used a quick and dirty "collaboration" to identify 5 million acres of National Forest lands in the state for "priority restoration work" a.k.a "logging." (Click here for source). Senator Daines has made it clear he wants more Montana control over federal lands. (Click here for source). In an interview with Brian Kahn on "Home Ground Radio," Regional Forester Faye Krueger said "For us the Farm Bill was a gift." Montana State Forester Bob Harrington said having the State involved "changes the playing field" and provides for more parties that can file amicus briefs against those who would litigate to stop the logging projects. Krueger agreed with Harrington and acknowledged that the $1 million being provided by Montana to help plan federal projects means "the Forest Service needs to produce." Indeed, the Farm Bill and its Good Neighbor Authority allow the State to plan and conduct the necessary environmental review for federal timber sales, leaving only the signing of the final decision up to the federal Forest Service. (Click here for source). The bottom line here is that Congress and state governments are already well on their way to increasing logging on National Forests by whatever means and lies necessary - and some "conservation" groups are complicit in the process!